Admissions Open at Concordia Colleges's Main Campus for the batch Fall 2018. CONCORDIA offers admissions in different fields of study for Bachelor Programs. University DescriptionConcordia Colleges, under the umbrella of the Beaconhouse Group, aspire to economically offer world class education in an innovative and technology-enabled environment. Our vision is to establish a House of Wisdom at the national level with a distinctive approach to cater to the current and future educational needs of the country and, at the same time, freeing our students from rote learning and tuition needs. We are focused on developing creative and confident students who will be capable of meeting any challenge in their lives. Our teaching methodology makes us unique. We will accomplish our mission by fulfilling the social responsibility of bringing a positive change in the society in terms of quality education, intellectual development and introducing good values. 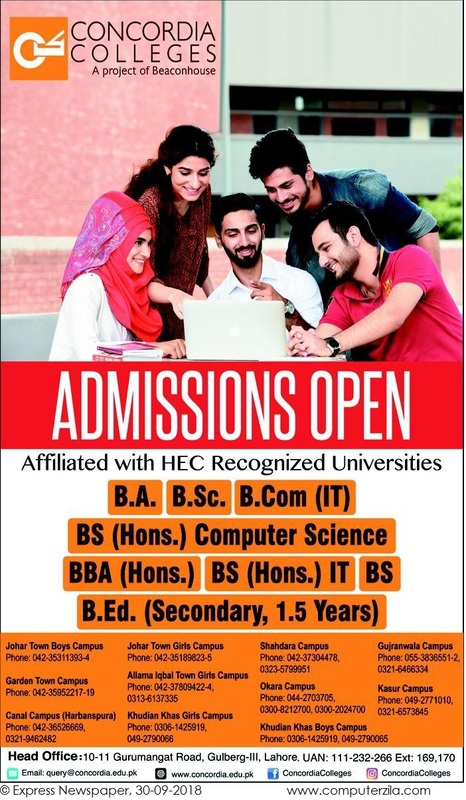 Campus Adress10-11, Gurumangat Road, Gulberg – III, Lahore.